Enzymes are the essence of physiological life and the biological workers in all living systems. Unfortunately, food enzymes are destroyed by cooking temperatures and leave our bodies working hard to compensate, causing all kinds of digestive problems. Hi-Zimes are created to be mixed with your food to replace what's been lost and help your body regain good digestion and total nutrition for optimum health. The ultimate high potency plant enzyme formula for the most complete digestion of the food we eat. Each capsule contains concentrated protease, amylase, lipase, lactase, cellulase, maltase, sucrase, and phytase enzymes, plus calcium and magnesium. They are the only biologically active - living -­ component of the food complex. However they are destroyed in foods by simply heating them to 120 degrees F. for only 30 minutes. The proteins, carbohydrates, fats, fiber, minerals and vitamins are inanimate "building materials" - animated by the enzymes. The enzymes digest, metabolize, and use the "building materials" to build and rebuild our bodies. Enzymes are necessary to make ATP. Ah, but our bodies make their own enzymes! Correct, but how?!?! By digesting our food, transporting it to the cells, assimilating it into our cells, and utilizing it, (all work done by enzymes), to make ATP ­ adenosine triphosphate. ATP is the energy molecule that powers all of the "mechanical" work in the body: every beat of your heart, every movement of every muscle, active transport of food molecules across the intestinal membrane, production of hydrochloric acid in your stomach, and synthesis of all proteins ­ which includes the production of all enzymes, just to name a few. By the way, even the activation of the ATP molecule to release its energy is done by enzymes. So the body can't do anything without enzymes, especially all of the steps that are involved in making ATP. ATP is necessary to make our own enzymes. Most of the ATP that our cells produce is used to synthesize proteins and produce metabolic enzymes. Therefore, anything that impairs our ability to make ATP, impairs our ability to make our own enzymes. Consequently, if our diet is enzymes deficient, (like when there is any bad odor in your bowel), then we've begun a vicious cycle that reduces our metabolic efficiency and results in ageing, degeneration, disease, and premature death. That is why Dr. Humbart Santillo has said, "Enzymes deficiencies are America's number one nutritional problem, and are responsible for more dis-ease than all other nutritional shortages combined." Dr. Edward Howell, the father of enzymes nutrition said, "there is no other mechanism in the body except enzyme action to protect the body from any hazard. It is ambiguous to say that nature cures, when we must know the only machinery in the body to do anything is enzyme action. Hormones do not work. Vitamins cannot do any work. Minerals were not made to do any work. Proteins cannot work. Nature does not work. Only enzymes are made for work. So it is enzymes that cure. Therefore the ability of the body to make any of the numerous enzymes needed for good health and long life must be kept at a high level by the methods incorporated in the Food Enzyme Concept." 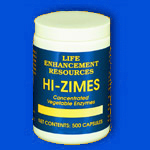 Hi-Zimes are the most powerful, effective, and versatile enzyme formula in the world today. They are formulated to digest all of the proteins, carbohydrates, fats, fiber, and sugars consumed in your diet. You can use one formula to do it all! It's safe, simple, effective, and economical. In fact, in order to buy the equivalent units of enzyme activity contained in Hi-Zimes, you would have to spend two to one hundred times as much with any other enzyme product. When you want the best enzyme product in the world - at the best value in the world - look for Hi-Zimes by Church of Abundant Life Health Ministry.